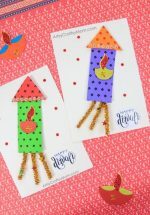 Thanks to Avanti who asked me for suggestions on making a few Diwali crafts with her son, I decided to ask the in house expert ( Lil P :D) if she would be interested in making a few cards for her grandparents. The lil imp had many ideas abt the what she wanted, the embellishments and who she wanted to give what..
Here’s what we made today. We had Glitter Glue, construction paper , starry stickers , and foam sheets. She helped me with this card.. why do I like her version more?? I so so love her tiny fingers..
Then she drew this awesome diya on her own. 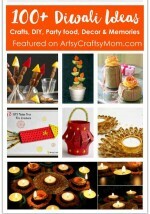 Where are your entries for the artsy-craftsy-oct?? LIl P made them for her grannies. 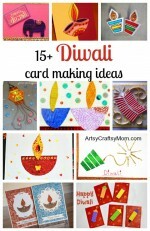 Very beautiful cards Shruthi! I like the fireworks card! oh my!! So beautiful.. such gorgeous cards.. Its so so lovely to receive cards..